For every 25k, a new entrepreneur is born. Mission to create 30 rural entrepreneurs in 6 months, and teach 1000 kids. Sumon, a 31 year old man residing in Piali, West Bengal, is a post graduate with Master of Arts (M.A.) degree in Bangla. Like many, he was unemployed, and earned his living through selling books as a hawker in suburban trains of Kolkata. But he is very skilled with his eloquent sales pitches to the commuters in his native tongue. We accidentally met Sumon in December’ 17, while traveling in one of those trains, clearly impressed with his sales skills. However, he had poor communication skills with English. We offered him a program, where he gets trained as a smartV teacher, and in turn, teach English to the kids of his village through our smartV Education Centre on a low cost model. 6 months down the line, 40+ kids are enrolled in his centre. His English skills have picked up immensely as well, along with better financial earnings and quality of life, not to mention the respect he garners in his village. The parents are delighted to see someone in their family speaking English, and who better than their own kids. 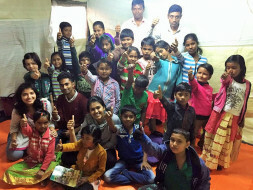 smartV Education Centre, is a unique teaching and business model, to impart reading, writing and communication skills to kids belonging to lower income groups, at their grade level. 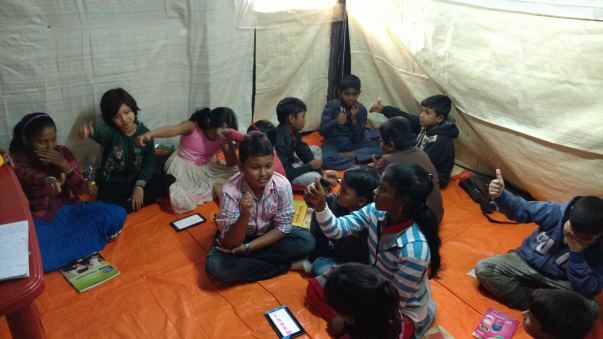 The model creates entrepreneurs who teach English to rural kids through tablet based software. The technology and curriculum are designed in such a way, that it does not require the teacher to be skilled in English. Anyone, who is a basic graduate, can get trained as a smartV teacher in a short time. At present, we have 90 kids registered across two centres at Piali(West Bengal), and Jibon Mondal Haat (near Sundarbans). A third centre is coming up at Sonarpur(West Bengal). We were able to create visible impact in kids who undertook our classes. Kids who could barely read properly and speak in English previously, can now read and speak English decently at their level. Our classes have been able to instill confidence and remove stage fright in kids. Buoyed by their improvements, we are on a mission, to create 30 rural entrepreneurs within the next 6 months, and teach 1000 kids. You can be a part of this mission. Every smartV Centre requires a setup cost, in the form of tablets, internet, marketing materials, travel costs, classroom materials etc. All sum up to be 25,000 INR as below. 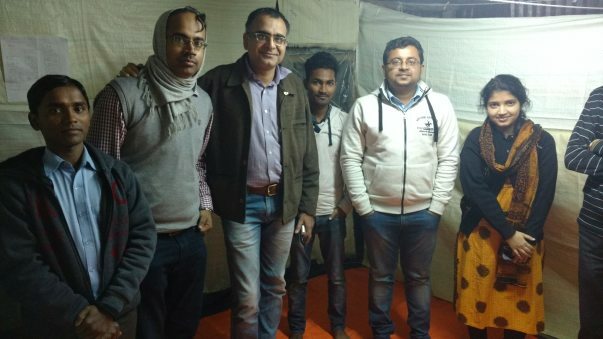 We plan to start each smartV Education Centre across rural West Bengal with 25,000 INR, raised through campaign, and a minimal investment of 10,000 INR (1 additional tab and misc.) on the part of entrepreneur, to have him/her financially obligated and motivated. Any donor who contributes to our campaign will receive periodic updates on the setup/running of the centre, improvement of the entrepreneur and the kids, as well as s/he will be eligible for a visit to the centre (at expense). Help us with #AdoptATeachingCentre, help us #CreateARuralEntrepreneur, help us take English to rural India. It's festive season here in West Bengal, with Durga Puja nearly upon us. We at Krishworks wish you and your family a very happy Durga Puja. It's been an interesting couple of months for us at Krishworks. 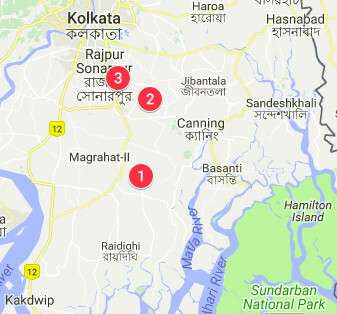 We're currently operating 3 centers (the Sonarpur center being the new one), with over 150 children impacted so far. We recently closed a deal with a school owner for 4 centers in the Canning area. We're currently training 10 teachers for those centers. In the marketing front, we tried partnering with local clubs to conduct a seminar on why English is important. Our first seminar, in Baruipur, had over 30 people in attendance, with 70% of them being women. At the existing centers, we found that conducting events where children speak English in front of the parents and the entire village was very effective in showing parents the progress of their child, and the value of what we do. Here's a video from the event in Piali! The parents at our 3rd center even requested us to increase the frequency of these events. 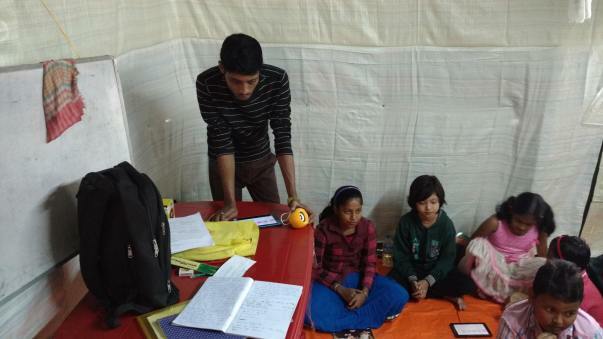 2 batches of children at Piali have completed Level 1 of our program, and have now moved on to Level 2. 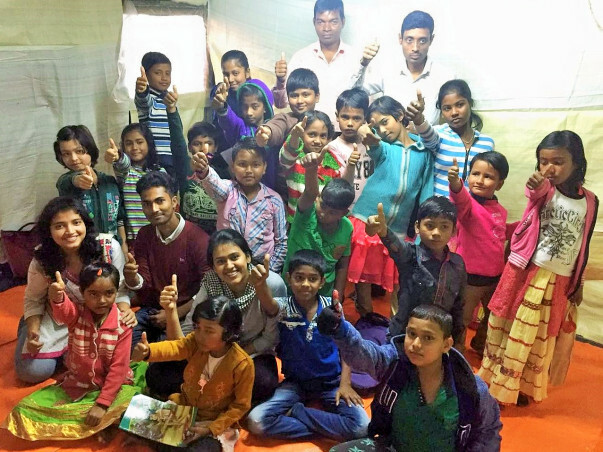 The teachers of our first 2 centers, Sumon and Anowar, are now helping us open and maintain additional centers. We currently feel that this will be the way forward as we grow to more centers. We got covered by Ei Samay, a Bengali newspaper from the Times Group. This led to us getting calls from all across the state! Our biggest immediate priority is converting these calls into centers. In the middle, we also won prizes at the ET Power of Ideas 2018, IIM Ahmedabad's Innovation Playground, and we're currently being incubated by IIM Calcutta's Invent program, ISB's Social Enterprise Accelerator, Tata's Social Alpha, and Surge Impact. Thanks for being a part of our journey so far! P.S. - Follow our Facebook page for pictures, videos and updates.